2016 was a big year for us. We premiered several brand new instruments, made updates to some of our classic instruments, and of course launched new finishes and options across our current lineup of guitars and basses. There’s a lot to cover, so we put together this handy run-down of the major happenings to make sure you didn’t miss out on any of the fun. Listed below (in no particular order), we’ve posted the eight new instruments we made available this year. St. Vincent Signature Model Guitar Envisioned and designed by St. Vincent with support from the award-winning engineering team at Ernie Ball Music Man, the unique electric guitar was crafted to perfectly fit her form, playing technique and personal style. 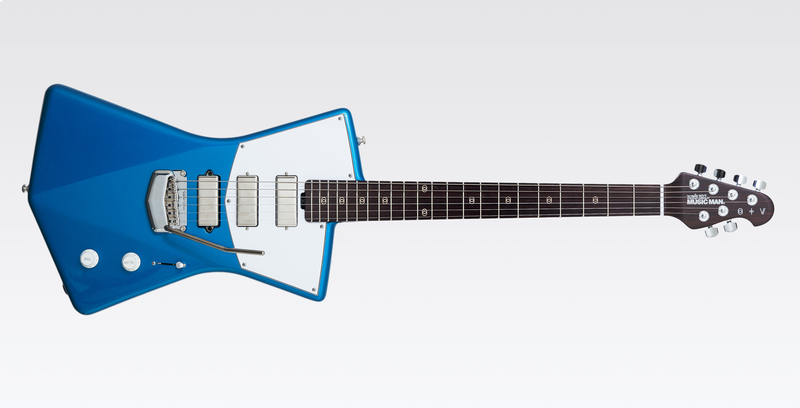 Crafted in Ernie Ball Music Man’s San Luis Obispo, California factory, the St. Vincent signature is available in black or custom Vincent Blue, a color hand-mixed by Annie. Featuring an African mahogany body, Ernie Ball Music Man tremolo, gunstock oil and hand-rubbed rosewood neck and fingerboard, St. Vincent inlays, Schaller locking tuners, 5-way pick up selector with custom configuration and 3-mini humbuckers, the guitar also comes complete with Ernie Ball Regular Slinky guitar strings. James Valentine Signature Model Guitar The Ernie Ball Music Man James Valentine “Valentine” guitar features a slab ash body, two Ernie Ball Music Man designed pickups (1-humbucker/1-single coil), with 3-way custom wired lever switch, coil tap, modern hardtail bridge with vintage bent steel saddles, 25.5-inch scale, oil and wax rubbed roasted maple neck with 10-inch radius maple fingerboard, 22 stainless steel frets, oversized 4-over-2 headstock and compensated nut, designed for superior tuning stability. The JP16 is a combination of the original Music Man John Petrucci signature model and later Ball Family Reserve models. Highlights include a lightweight basswood body with high gloss Black Lava finish and a new Floyd Rose 1000 Pro Floating Tremolo system. The JP16 also features the return of the original scooped forearm contour which will provide many hours of playing comfort. First fret JP16 logo, stainless steel frets and a smokey ebony fretboard are standard options on the ultra thin and fast figured/roasted maple neck. A pair of DiMarzio Sonic Ecstasy humbuckers and 20+ dB gain boost push/push volume pot provide the JP16 with plenty of sizzling tone. StingRay Guitar The StingRay guitar features updated vintage spec humbucking pickups, a super smooth modern tremolo system and off-set lightweight African Mahogany body. The sound is big and bold when needed but smooth as glass if desired thanks to the perfectly voiced custom pickups. 3-way switch accesses versatile coil combinations while oversized 4 over 2 headstock with straight string pull provide superior tuning stability. Flawless craftsmanship throughout make the Stingray a perfect culmination of old world aesthetics and styling with modern design and playability. 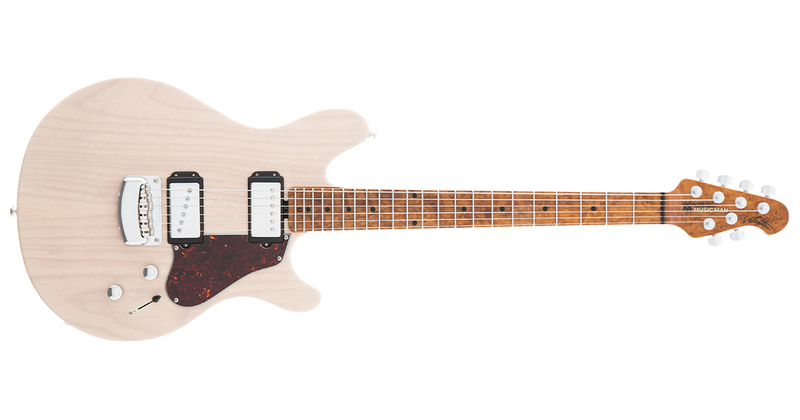 Cutlass Guitar The Cutlass features updated vintage spec electronics, a super smooth modern tremolo system and lightweight alder body are welcome refinements to the Cutlass. Oversized 4 over 2 headstock with straight string pull provide superior tuning stability and flawless craftsmanship throughout make the Cutlass a perfect culmination of old world aesthetics and styling with modern design and playability. Caprice Bass The Caprice, another welcome newcomer to the Modern Classic family of instruments is a bold new statement in passive design. A workhorse bass that is capable of blending two distinct pickup voicings offering a variety of tones suitable for any musical environment. This compact offset design provides a body shape that is comfortable and balanced along with a slim neck profile that makes this bass a pleasure to play. The top-loading bridge is made from hardened steel and complemented by a newly designed oversized headstock with the familiar 3+1 tuner arrangement. As with the Cutlass, the Caprice is a sleek modern bass with vintage features that stays true to its Music Man heritage. 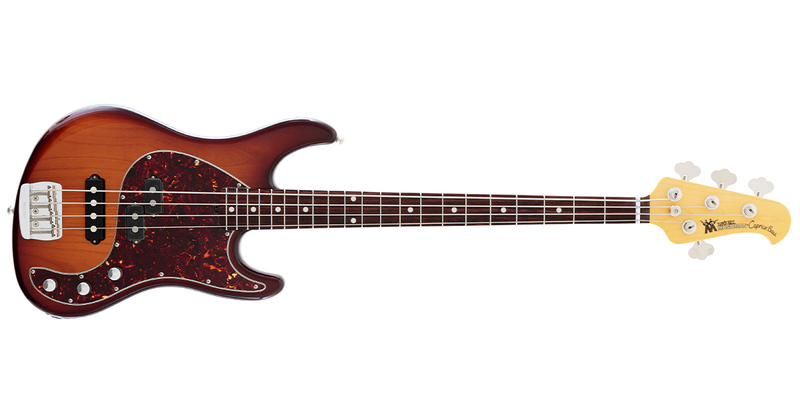 Cutlass Bass The Cutlass bass is the latest edition to the Modern Classic line of instruments. This newly designed passive 4-string bass features rich, vintage tone surrounded by streamlined, modern appointments for ultimate comfort and playabilty. The Cutlass’s many great features include a old school split-coil humbucking design for that big round bottom end tone, a comfortable “C” shaped neck carve and a lightweight contoured alder body that fits like a glove. The top-loading bridge is made from hardened steel and complemented by a newly designed oversized headstock with the familiar 3+1 tuner arrangement. 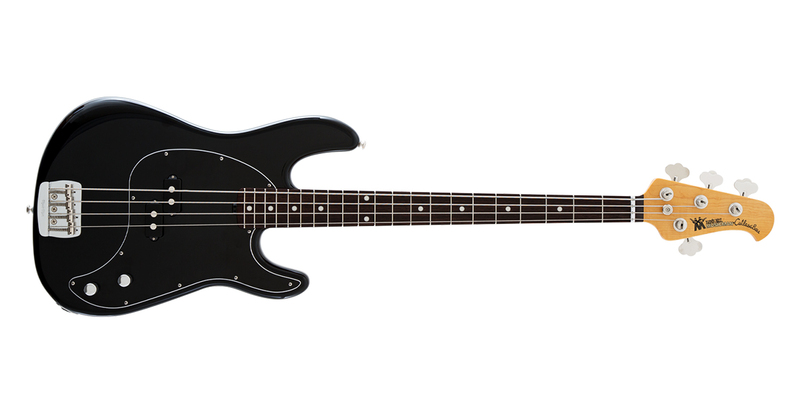 All in all the Cutlass is a sleek, modern bass with vintage features that stays true to its Music Man heritage. StingRay 40th Anniversary “Old Smoothie” Bass Since its introduction in 1976, the Music Man StingRay has been embraced as one of the world’s classic electric bass designs. To celebrate, Ernie Ball Music Man is proud to introduce the 40th Anniversary “Old Smoothie” StingRay, a faithful reproduction of StingRay prototype #26, designed for Sterling Ball during his time spent testing and developing the original prototypes back in the 70’s. Named for its smooth even tone that is reminiscent of the highly sought after vintage Music Man StingRay sound, “Old Smoothie” has been precisely reproduced including the one-of-a-kind custom made 10 pole piece pickup design, body headstock and pickguard shape, 34-inch scale maple neck and fingerboard, low profile narrow frets, active electronics, hardware and exclusive chocolate-burst finish. WHAT HAPPENED TO THE AMPS?